During our daily jaunts around Chagrin Falls last week, for dinner one of those evenings, we hit up Umami, an Asian restaurant with a little twist. 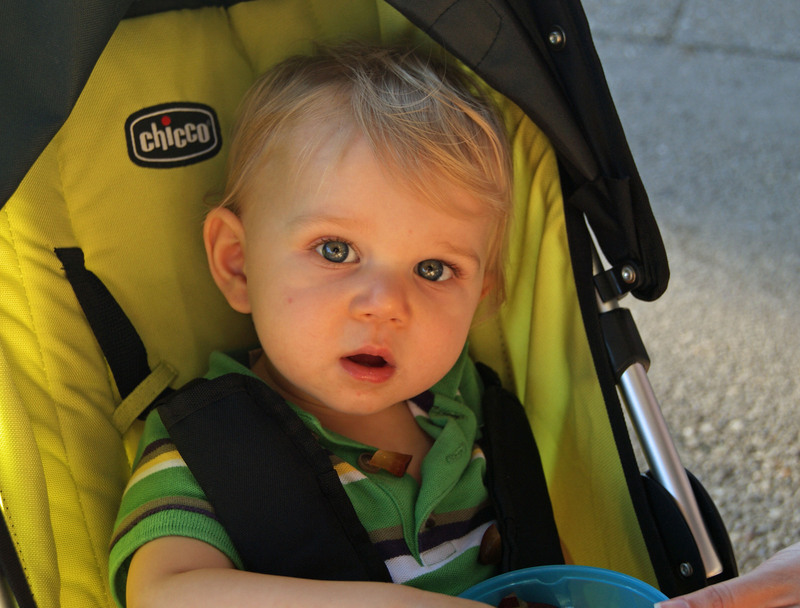 Since we had C with us, we wanted to be able to sit outside, and as they have a couple small tables on the sidewalk out front, it worked out perfectly – we got to sit and eat while he people-watched. The weather was perfect, and he behaved pretty well, so it was a rather enjoyable meal. Dinners are separated into small plates and large plates (and also salads and sushi), and we decided to split one of each. 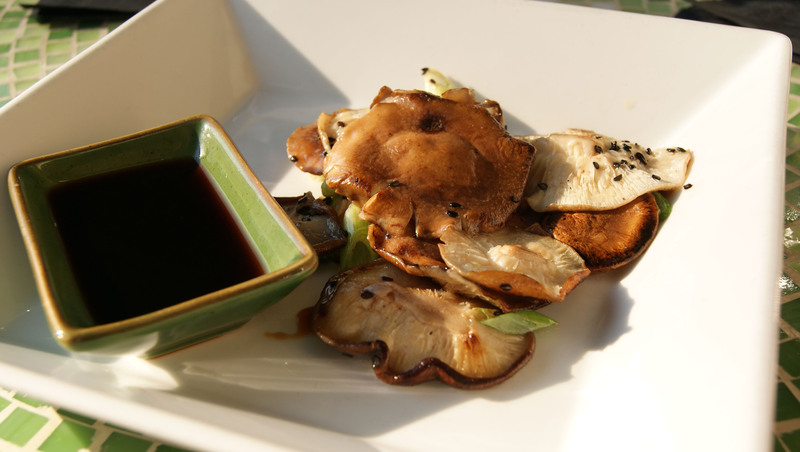 For the small plate, basically an appetizer, we chose Roasted Shiitakes – a nice heap of shiitake mushrooms laced with scallions and black sesame seeds, and served with a ponzu sauce (kind of a citrusy soy sauce). The mushrooms were meaty and tender, and not tough as they can sometimes be. The sauce was nice, not overpowering, but a little on the salty side, though we use a low-sodium soy sauce at home, so we’re accustomed to something a little lighter. 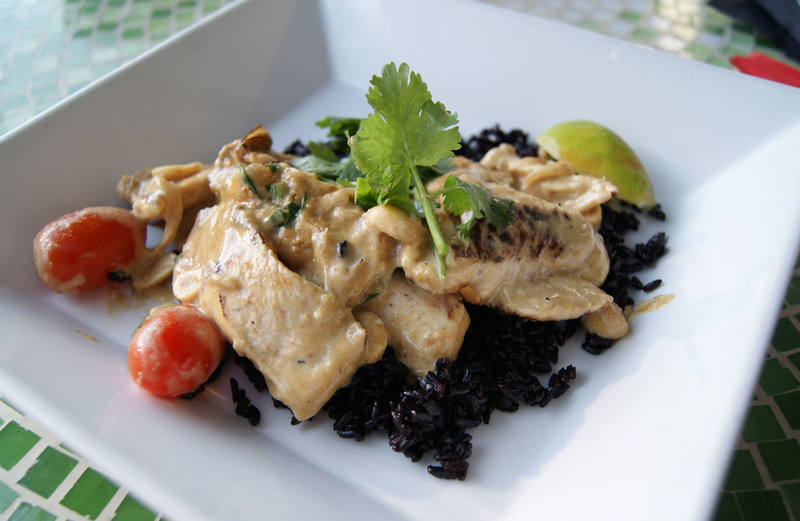 The large plate we split was the Massaman Curry Chicken, strips of chicken tossed with cherry tomatoes, galangal, and peanuts in a lime curry sauce, all served over a bed of black rice. The chicken was very moist and cooked to perfection, and the sauce was light and refreshing, with the lime providing a nice counter to the richness of the peanuts. The rice was sticky and had a light nutty flavor that worked well with the rest of the dish. "Cheerios? Seriously guys? All this good stuff and you give me Cheerios?" 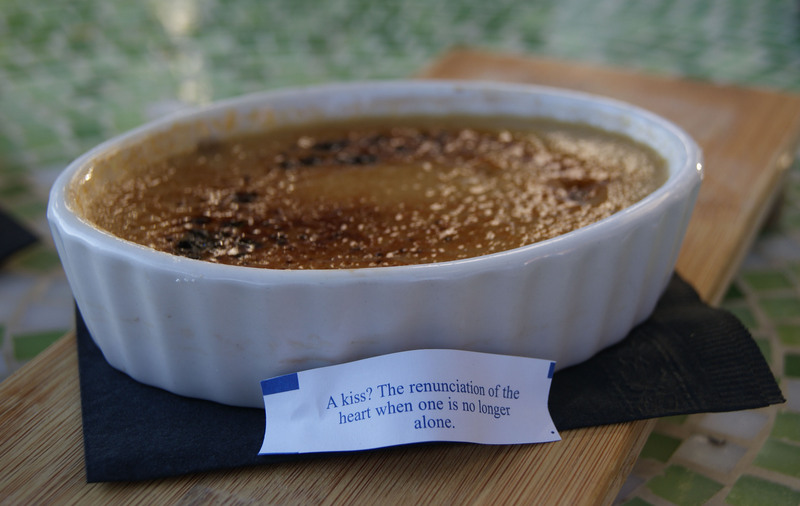 Finally, for dessert we shared a jasmine creme brulee, which came topped with a fortune cookie. It was your standard creme brulee (which I’m always a fan of) with just a hint of a flowery background. I’ve had other dishes that utilize flowers or herbs (lavender is a big one), and sometimes the ‘floweriness’ is overwhelming and masks the rest of the flavors. Not so in this case. You can just taste the jasmine, but it’s very delicate and does not take away from the creme itself. Final verdict: Umami is a nice place for a good casual dinner. Nothing overly fancy here, and the sidewalk seating was a plus, although there are only a couple tables outside, so they may or may not be available. Service was reliable, pricing was reasonable (about $40 for both of us), and the food was very good. Umami gets five stars out of seven. Note: I’ve revamped my rating system from a possible four stars to seven. S thought four wasn’t enough to cover the range of restaurants we visit, and I gave in without a fight. The best of the best will now get a seven, and Denny’s is still holding down the fort at one star. It’s all about the goat cheese dumplings at Umami… yum! Not always on the menu, but if you ask they can usually set you up.